Medicare for all has had majority support in the United States for more than a decade. As more people become aware of the details, support is growing. An August 23rd poll, conducted by Reuters/Ipsos, found 70% of the public now supports Medicare for all. 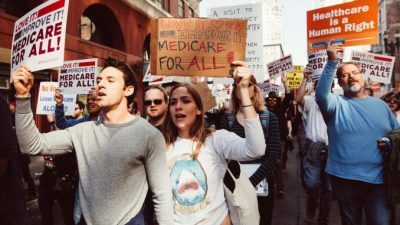 We see the potential for winning National Improved Medicare for All in the early 2020s if people continue to build the movement necessary to demand it. This widespread support is occurring because health care is in a crisis in the United States that touches every family. A growing majority of doctors and medical students are urging Medicare for all because they are experiencing the negative impacts of a health insurance-dominated healthcare. There is a large enough percentage of the population who understands the issue sufficiently that they are educating others about it. People know that national improved Medicare for all is a publicly-financed, privately-delivered system in which all people are enrolled and all medically necessary services are covered. As a result of this spreading understanding, despite the media failing to tell the truth about Medicare for all, health profiteers lying about it and big business interests doing their best to stop progress toward a national consensus, people are not falling for the misinformation campaign. Efforts to mislead the public, as coverage of a recent Koch-funded research effort showed, are backfiring. People are pushing back against the false narrative and are forcing the media, in some instances, to tell the truth. Now, majorities of voters in both major parties support Medicare for all. According to the new poll, support among Democrats is 84.5%, 4.8% percent do not know and only 10.7% oppose. It will be difficult to win the Democratic presidential nomination without supporting National Improved Medicare for All. Indeed, most of the serious contenders for the nomination are already co-sponsors of S 1804, the Medicare for All Act, in the Senate and two-thirds of Democrats in the House, are co-sponsors of HR 676, the gold standard bill called “The Expanded and Improved Medicare for all Act.” In many states, to win the Democratic nomination for US Senate or governor, as well as in many House districts, it is becoming essential for candidates to support National Improved Medicare for All. On the Republican side, for the first time, a poll shows majority support for Medicare for all, 50.9%, 10.7% do not know and only 37.4% oppose. If a Republican begins to champion the issue and explains it in terms that Republican voters can relate to, i.e. Medicare is US-invented healthcare that has worked for seniors since 1965 and has been copied around the world by countries to provide health care to all their citizens, that support will grow. Medicare is the most cost-effective way to provide health care; one-payer reduces the bureaucracy and administrative costs of paying for health care and saves the nation trillions of dollars. Medicare is good for business as the cost of healthcare is set and businesses are no longer victims of unanticipated premium increases each year. A national single payer health care program allows US corporations to compete with corporations in other countries that have universal healthcare systems. Even the most capitalist countries around the world have national health plans that provide health care to everyone in their country because they recognize the efficiencies of a public system and the benefit of health security for workers and their families. Democrats support 84.5%, do not know 4.8% and oppose 10.7%. Republicans support 50.9%, do not know 10.7%, and oppose 37.4%. All support 70.1%, do not know 9.3% and oppose 20.6%. Reuters/Ipsos, June and July 2018. The United States is currently in the phase of “Majority Times” for making national improved Medicare for all a reality. Our task right now is to build national political consensus, where the near-universal view is so strong that no politician of any party can oppose Medicare for all. Our second task is to build the power of the movement so it cannot be ignored. There needs to be a small percentage of the public who will be vibrant, aggressive and strategic in their advocacy so that people in power fear they will be called out in public for opposing the national consensus. The job of the single-payer movement is not to elect Democrats or Republicans, it is to continue to change the political culture so no matter who is in office, they must enact National Improved Medicare for All (NIMA). We do that by educating ourselves and others about NIMA and showing our support visibly in media, such as letters to the editor, in community or activist groups to which we belong and through demonstrations. The movement must be well educated on the essentials of National Improved Medicare for All so it cannot be taken off track by false non-solutions, a type of bait and switch that sounds like what we want but preserve the current problems. This includes plans like “Medicare Extra for All,” a public option, or proposals that protect the insurance industry in the disguise of Medicare Advantage or some other marketing name that they think can fool people. Both parties have put in place policies that undermine current Medicare and Medicaid. That’s why we need to emphasize that the movement is working for national IMPROVED Medicare for all. Senior citizens and those with Medicare and Medicaid will have better healthcare, that costs them less when NIMA is put in place. National improved Medicare for all will cover all body parts, e.g. eyes, ears, teeth and mental health. It also means that long-term care will be coveredwith a priority on home or community-based care. Businesses are an important part of building the movement. Unpredictable healthcare costs are one of the biggest problems that businesses of all sizes have to deal with. Each year, they are required to pay more for their employee’s health benefits and provide less coverage. The cost of premiums is consistently rising in unpredictable ways as are out-of-pocket costs, such as co-pays and deductibles. At the same time, insurance companies are narrowing their coverage and reducing the providers included in their networks. Business owners need to understand that national improved Medicare for all will be less expensive and more predictable for them. The same is true for federal, state and local governments that pay the cost of health care for their workers. This is currently an uncontrollable expense for government at all levels. The recent teacher strikes had as a root problem the cost of healthcare. The same is true for police, firefighters, and all government workers. Single payer solves these healthcare costs for local governmentscreating a much-needed windfall of resources that could be used for other underfunded necessities. If people who support National Improved Medicare for All work on these issues in a consistent, uncompromising and strategic way, we will achieve a national health program that will improve the lives of all people. Single payer health care would provide the same standard of care to all people, regardless of income or wealth. This will help to eliminate the great health disparities that exist now. Putting in place national improved Medicare for all will also do a great deal to decrease the unfairness of wealth inequality by providing every person the same opportunity for health and ending bankruptcies and loss of housing due to medical illness and debt. For our health and for our economy, this is the time to put in place National Improved Medicare for All. Featured image is from M-molly Adams from Flickr.